I’m Taylor. I created Travel Outlandish to showcase an adventurous and alternative way of travel. People who travel like me want more than big bus tours and luxurious hotel rooms. Instead, we’re seeking experiences. We want moments of spontaneity, genuine interaction, and the kind of adventure that doesn’t feel unpacked from a box. Travel Outlandish is about sharing these unique travel experiences. Unusual hotels, alternative routes to a popular destination, offbeat attractions, cultural immersion programs, street food tours, and other uncommon experiences all have the potential to make travel more interesting. I strive to capture the feeling of a place through photography and narrative, empowering the people who come here to experience it for themselves. There’s too much information out there. In fact, travelers will visit an average of 38 sites before booking. Let’s collaborate to get their attention. When you work with us, you can reach your target audience in a way that traditional advertising can’t — through authentic content. Let us tell your story in a way that it’s never been told before. We promise honesty and quality in everything we create because it is what we believe in and it’s what our audience has come to expect. Since 2014, Travel Outlandish earned the trust of like-minded travelers from around the world. You can reach them at scale when you work with us. Don’t just take my word for it. Take a look at some of our past partnerships and imagine what we can do for your brand! 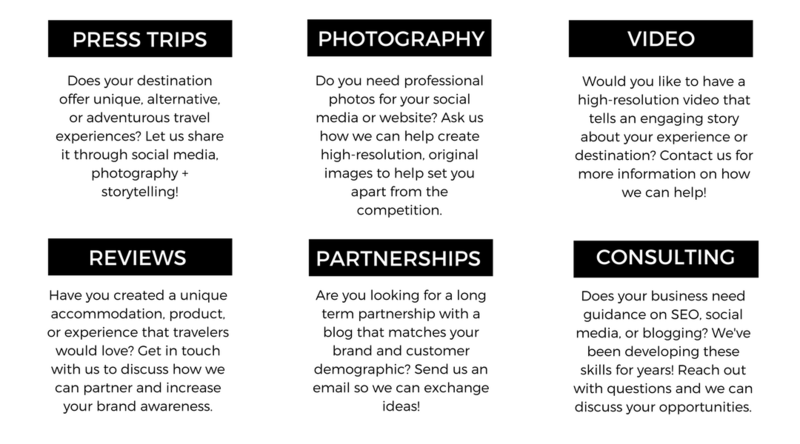 Are you looking for reviews, press trips, travel photography or video, content creation, or consulting? Travel Outlandish is always open to compatible partnerships. Send me an email with details about your opportunity and I’ll be in touch with a rate sheet and a complete media kit. Look forward to collaborating with you!